"Ever since I was little I have had a close contact with the sea and shipping matters. University of Plymouth was offering an honours degree that combined this with merchant navy training so, for me, the choice was clear. Besides, before making up my mind I visited Plymouth and it seemed like an excellent place to spend part of my life. My time on the course certainly confirmed that I had made the right decision. Immediately after graduating I started working for Bibby Line, the company that had been sponsoring my studies. This was not an obligation but rather a fantastic relationship that we both wanted to take further. 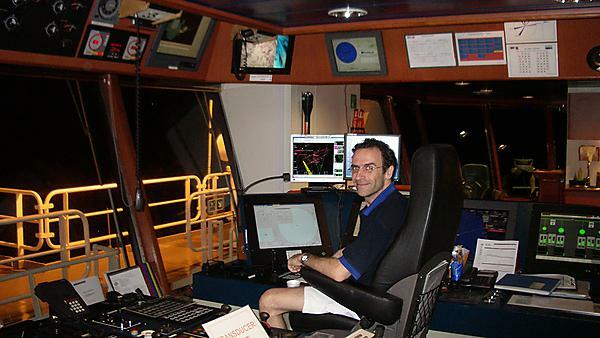 Today I am still working for Bibby as Senior Dynamic Positioning Officer/1st Officer in one of the most advanced ships worldwide. The ship is a dive support vessel capable of working on sub-sea operations as deep as 300 metres. My duties are marine related and, among other things, I am in charge of navigation and, when diving, maintaining the vessel at the position and heading that are optimum for the operations. Although we work hard, this job has given me the opportunity to experience life at sea, something I always desired, and has given me quality free time for continuing with my studies and now I am reading for a PhD in Engineering Mathematics at the University of Bristol. I have no doubt that my decision to study at Plymouth has changed my life. The course takes some of the credit but the real value is found in the people who made it possible."